Watch the famous Times Square ball drop on New Year’s Eve from an exclusive Manhattan party suite, high above the crowds. 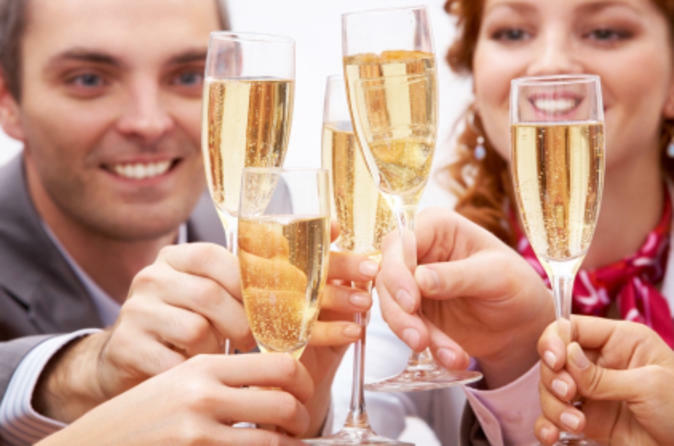 Enjoy an open bar, hors d'oeuvres, dinner buffet and desserts while ringing in the New Year! Before the ball drops, dance to the latest hits and enjoy fabulous views over the glittering lights of Times Square. One of the most iconic New Year’s Eve events in the world is the Times Square ball drop in New York City. Skip the packed-in-like-sardines crowds down on the street and watch the festivities from 22 stories above! In your luxurious party suite at Convene Conference Center, you’ll have a bird’s-eye view of the action. Located in the heart of the Theatre District, Convene features expansive windows on all sides that provide magnificent views up and down both Broadway and 7th Avenue. Watch the crowds as they hover together, trying to stay warm while you enjoy an open bar, hors d'oeuvres, dinner buffet stations, desserts, music and a warm, festive room complete with decorations, favors and souvenirs! While you wait for the big moment, dine on the sumptuous food options, watch New Year’s Eve specials on the flat-screen TVs, capture the fun in a photo booth, delight in the performance of a roving magician and get your groove on to tunes spun by the DJ. When the countdown to midnight begins, grab a glass of Champagne from the open bar and watch the ball drop! Confetti will fly in the party suite, making for great photo ops. This exclusive party will sell out quickly, so book your ticket now so you don’t miss out on an unforgettable way to ring in 2019!